Legendary value investor Benjamin Graham is probably most famous for his Mr. Market parable. In the story, an investor is greeted each day by Mr. Market, who offers to purchase the investor’s stocks. Every offer is different, and sometimes the price is insanely high, sometimes it seems fair, and other times it is clearly too low. But one thing remains the same – the intrinsic value of the investments does not change. As a result, the investor is left to decide when to buy and sell based on the relationship between the intrinsic value and the price Mr. Market is offering. All value investors today should keep the analogy in mind, and implement the overall concept. 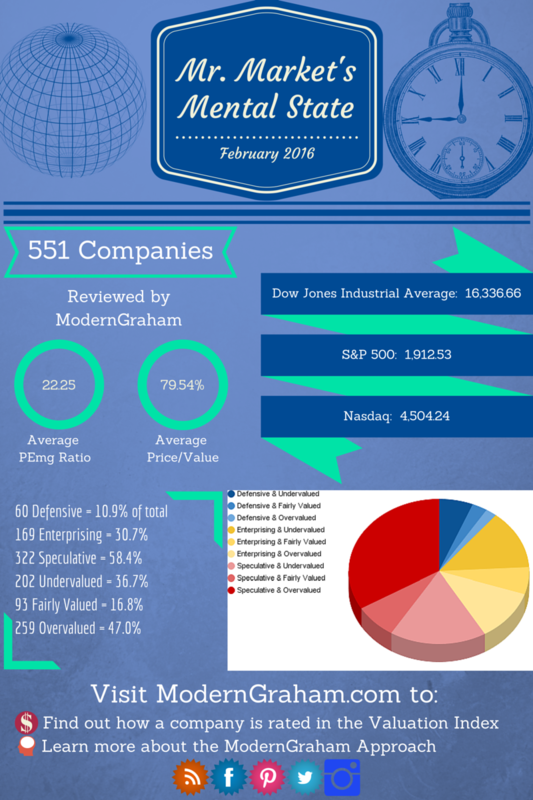 To assist in that goal, ModernGraham has various tools available, and the infographic shown above is one of them, displaying a summary of the valuations of 551 companies reviewed by ModernGraham. This month, out of the 551 companies reviewed by ModernGraham, the average PEmg ratio (price over normalized earnings) is 22.25 and the average company is trading at 79.54% of its intrinsic value. Last month, the average PEmg ratio was 22.87 and the average company was trading at 82.61% of its intrinsic value. The highest PEmg average we have seen while tracking this information was 26.17 in December 2014 while the lowest PEmg average was 22.25 in February 2016. The highest average intrinsic value was 93.48% in January 2015 and the lowest average intrinsic value was 79.54% in February 2016. Each month ModernGraham takes a look at the Dow Jones Industrial Average, listing out each individual component in an easy to read table, and calculates a value for the index that is based on the ModernGraham valuation model’s estimates for intrinsic values for each component. Over time this figure can be useful for determining whether the market as a whole is undervalued or overvalued. Readers may find it useful to review the history of this screen to see how the index has moved in relation to its intrinsic value. At the time of writing, the Dow Jones Industrial Average (DJIA) was at 16,336.66. The ModernGraham Valuation of the DJIA was 20,375.43. 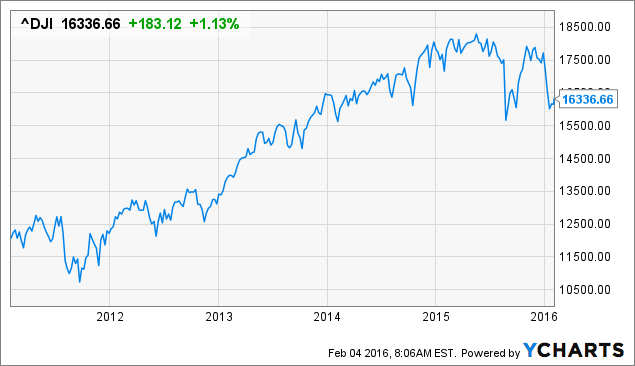 As a result, the DJIA was trading at 80.18% of its estimated value. This figure is within the ModernGraham margin of error, and therefore it appears the DJIA is presently fairly valued. To see the individual valuation articles, please click on the company name in the table below. For the investor type, a “D” indicates the company is suitable for the Defensive Investor, an “E” indicates the company is suitable for the Enterprising Investor, and an “S” indicates the company is considered speculative at this time. If you enjoy this content, please share it with your friends on Facebook, Pinterest, or Twitter! The author held a long position in Home Depot (HD) and Walt Disney Co. (DIS) but did not hold a position in any other company mentioned in this article at the time of publication and had no intention of changing that position within the next 72 hours. See my current holdings here. This article is not investment advice; any reader should speak to a registered investment adviser prior to making any investment decisions. ModernGraham is not affiliated with the company in any manner. Please be sure to read our full disclaimer.